Bishop Jarrett ordains Peter Wood at St Carthage's cathedral. Former school captain (2001) of the Marist Fathers' College of St John's, Woodlawn, Peter Wood, was ordained priest on Jul 30 at Lismore, NSW. The principal with numerous staff and students of Woodlawn College were part of the three hundred-strong congregation witnessing the two-hour ceremony at St Carthage's cathedral, Lismore. Bishop Geoffrey Jarrett presided in the company of forty local and visiting priests and deacons. A reception followed at Woodlawn College. 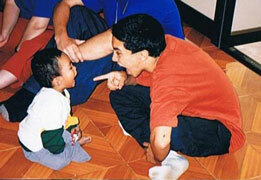 In 2002 Peter was part of Marist Mission Centre's 'The Other Half' (TOH) experience, visiting remote and poverty-stricken parts of Bangladesh and Thailand. Fr Peter will conclude his theological studies at the Seminary of the Good Shepherd, Homebush, NSW, before taking up a pastoral appointment in Lismore diocese. Above: 1. Special moments during the ordination ceremony at St Carthage's cathedral, Lismore. 2. Woodlawn chaplain, Fr Paul Pidock SM lays hands, then offers the sign of peace to Fr Peter. 3. Clothing in priestly vesments / anointing of the hands with the oil of chrism. 4. A visit to the Lady Chapel before the close of the ceremony / Fr Peter with another former Woodlawn captain and TOH-er, Joey Carter. Below: 1. 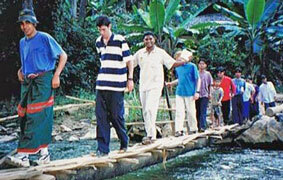 Peter Wood leads the way at Maera Moo refugee camp, Thailand, during the TOH of 2002. 2. The TOH shirt for 2002 / Peter with TOH-ers and local people in Bangladesh slums. 3. In Thailand with HIV/AIDS children / a musical moment at Maesot's 'Crocdile Tear', Thailand. 'Marist Laity Australia' chose the celebration of the Fourviere promise for the commissioning of their new leadership team. At an afternoon Eucharist and celebration hosted by the Marist Fathers on Jul 25 at Villa Maria parish hall, Hunters Hill, co-leaders of MLA, Andrew Dumas and Margie Woods, thanked the retiring committee led since 2003 by Maria Baden. Australian Marist Provincial, Fr Paul Cooney SM, presided at the Eucharist during which the new laity team were commissioned and the retiring group thanked and farewelled. Members of all Marist branches -- priests, Sisters, Brothers, Missionary Sisters and Laity -- were present for the ceremony and celebration. 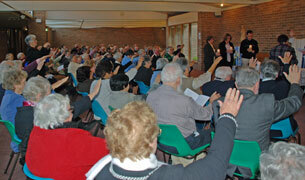 The Jul 23 anniversary of the Fourviere pledge in 1816 is hosted by a different Marist branch each year in Sydney and, indeed, in many parts of the Marist world internationally. See also Marist Laity Australia. 2. Liturgical music from Fr Kevin Bates SM / the Marist family icon 3. 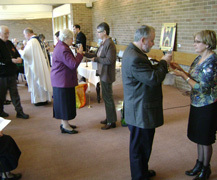 Communion distributed by Marist laity leaders / Fr Paul Cooney with Assistant-General, Fr Kevin Duffy SM. On Jul 25 Australian-born, Br. 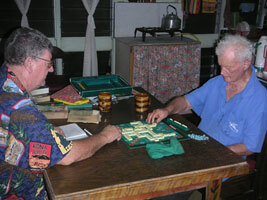 Andrew Ayliffe SM, died at the Home of Compassion, Suva, Fiji, aged ninety-three. His passing marks the end of an era in the life of the Oceania Province of Marists. Born in 1916 in Townsville Qld, and baptized in the cathedral as George Ayliffe, Br Andrew's family soon moved to Sydney where he was to attend primary schools in Lane Cove and Hunters Hill. He claimed he was the first day boy pupil at the Jesuit College (St. Ignatius) at Riverview. After secondary school he started his studies for priesthood at St. Columba's College, Springwood NSW (1934-36) then leaving to consider life as a lay missionary after hearing Bishop Aubin of the Solomons speaking at St. Patrick’s in Sydney. George Ayliffe then worked as a casual clerk at the Sydney waterfront for two years. In 1938 he traveled with Bishop Aubin and worked for two years in the Solomon Islands before returning to Sydney to start his novitiate in the Society of Mary. After novitiate Br. Andrew attended the Sydney Technical College in 1942-43, following courses which would enable him to teach manual arts and woodwork. where Br Andrew spent many of his senior years. At Mass with the Marist novices in Tutu's Marian grotto. The various appointments and achievements of Br Andrew included: Solomon Islands: 1946, building the church at Tanagai; 1947, built classroom at Tenaru; 1947-51, completing the mission station at Terapaina; 1982, built the presbytery at Dala; 1953, sawmill and workshop, Buma; 1954, whole station for Sisters and priest, Avuavu; 1955-ca 72, Tanagai printery; 1973 Kesao Boys Centre, Visale; 1974, in Australia for health reasons. 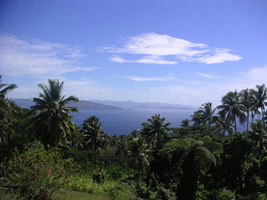 Tutu, Fiji: 1975-2005, novitiate and brothers' training staff; 2005-10, Home of Compassion, Suva. A life wonderfully lived. Rest well, Br Andy! Remembering this promise and the earlier call at Le Puy to begin a Marist Society, forty participants in the 'Year of Prayer for Marist Vocations in Asia-Pacific' gathered at Villa Maria, Hunters Hill, on Jul 24. After the parish vigil Mass at Holy Name of Mary church, Year of Prayer members enjoyed one of Fr Bob Barber's barbecues before gathering in the Colin Centre's 'green room' for presentations about Le Puy and Fourviere. During the evening the Fourviere pledge was read by all as well as the 'Saturday Prayer' now translated into twenty-four languages. On Jul 23, 2001 St Patrick's Courtyard Coffee Shop opened its door. 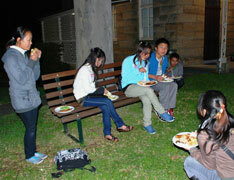 Forty-six volunteer workers from across Sydney and beyond staffed the service. Nine years later there are still over forty volunteers, eighteen from the original group. Founder and coordinator of the Coffee Shop, Sr Judith de Montfort SMSM, recalls the opening days: ''People I knew came out of the blue to offer their help. They have enabled us to provide a Sunday to Friday service ever since." "One of the best things about the shop", says Sr Judith,"is how it brings people together. Originally many would come singly for their coffee; now those same people come to meet up with friends they've met here." 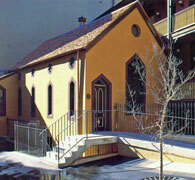 The coffee shop is housed in what was originally the 1876 chapel of the Sisters of Mercy renovated as part of the St Patrick's refurbishment in the late 1990's. Pastoral volunteers, including Br Colin Campbell SM, come regular to provide a listening ear to cioffee shop patrons. From left: 1. This sign board was originally at Marist Chapel, Young St / the cake display. 2. part of the wide range of religious goods for sale / books and cards are available as well. 3. Novena-goers patronise the coffee shop / some of the fortyu-four voluntary staff (Sr Judith, second from right) 4. 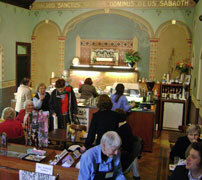 The coffee shop is open bewteen 10 am and 2 pm, six days weekly / volunteer pastoral staff member, Br Colin Campbell SM. Rome-based Assistant-General of the Society of Mary, Fr Kevin Duffy SM, has visited Australia as part of a familiarisation experience in the Marist areas of Asia-Pacific. Before this Fr Kevin participated in the annual MAP (Marist Asia-Pacific) leaders' meeting in Davao, Philippines in June before visiting the Marist Mission at Ranong, Thailand. Whilst in Australia he led a retreat for the Marist Sisters at Kincumber, NSW, and consulted with the Australian Marist Fathers provincial council at its Jul 20 meeting. Former member of the English and European provinces, Fr Kevin has worked in a number of mission territories and lectured in formation communities in Australia and New Zealand. In Australia he has a special mandate to represent the Society of Mary's international leadesrhip team. The Australian sector leadership of the Marist Sisters has moved its base to historic Woodbury Hall in the grounds of Villa Maria monastery, Hunters Hill. 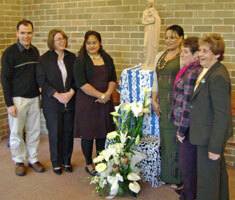 The sector is part of the wider region of Marist Sisters embracing the Philippines, Fiji, New Zealand and Australia. Above: Sector leader, Sr Gail Reneker SM, settling into the Woodbury Hall premises. 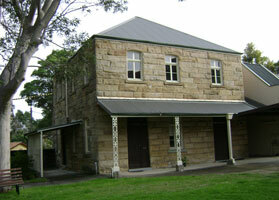 Constructed in 1905 this fine sandstone building has been home for various missionary groups in the development of the Church in Oceania, including the Marist Missionary Sisters. The Australian Province of Marist Fathers has lost one of its senior and most respected confreres with the death of Fr Tom Maloney in Lismore, Jul 06, aged eighty-nine and a priest for sixty-one years. His funeral takes place from St Carthage's cathedral, Lismore, Jul 13. 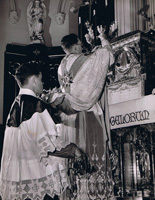 Fr Tom Maloney celebrating the Eucharist at St Patrick's, Church Hill, in the 1940s. Fr Thomas Gregory Maloney was born in Lismore, NSW, in 1921, the eighth of eleven children, including brother Steve who also became a Marist priest. After primary schooling at Blakebrook state school and Our Lady Help of Christians, South Lismore, Tom moved to the Marist Brothers at Lismore before completing his final two years at St. John’s College, Woodlawn. He entered the Marist seminary, Toongabbie, NSW, in 1940 and was professed as a Marist on Feb 1942 and ordained priest at St Patrick’s, Church Hill, in Sep 1948 by Marist Bishop Thomas Wade. After ordination Fr Tom was appointed to the staff of St Patrick’s then in 1953 joined the group of Marist 'home missioners' based at Ashgrove, Qld. In 1956 he became the first Marist parish priest of Redcliffe, Perth, WA. 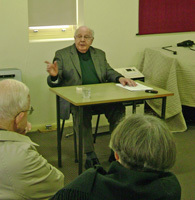 Six years later he moved to the parish of Claremont, Tasmania, and then in 1965 to Burnie parish. In 1971 Fr Tom began a new phase of life by becoming chaplain to Marist College, Ashgrove, Qld, where he was a popular presence amongst the Marist Brothers and their students for the next 18 years especially as cricket coach and commentator. 1988 was a year of renewal and professional development which included programs in the USA and New Zealand before a move to the Marist community at Lismore in 1989. Here Fr Tom took on the role of chaplain to the Lismore Base and St Vincent’s Hospitals. He retired from this role in 2007 brought on by poor mobility and circulation but maintaining a remarkable ministry of visiting the sick. For his great hospital work Fr Tom was awarded the Order of Australia Medal in the Australia Day honours of 2007. May he rest in peace. "When Tom arrived at Ashgrove, Billy McMahon was Prime Minister and Australians were still fighting in Vietnam! In Fr Tom we see exemplified in many ways the kind of priest that Fr Colin wishes to give to the Church when he founded the Marist Fathers - a priest who would win people by goodness and tenderness, who would excuse the failings of people, who would blend in and become part of the local Church, who would work hard and be without airs and graces, who would take any and every opportunity to do good. Tom's faith is real, genuine and boundless. 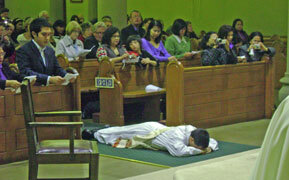 He loves the Church and its Sacraments and rituals. Perhaps the most remarkable thing about Tom's ministry, though, is his devotion to the sick, dying and the deceased and this has been quite an extraordinary part of his ministry. We Brothers count ourselves especially fortunate to have Tom live with us, not as a stanger but as an integral part of our community these past 17 years. He is a character. A storyteller. A conversationalist. A confidante. A sports coach. A traveller. He manages to combine the prudence of the dove with the cunning of the serpent - especially when it's a question of advancing Ashgrove and downing a certain other school. There was sadness at leaving, but also recognition that the time was ripe, and happiness at the prospect of retiring in familiar surroundings.....a tribute to a good priest who became a byword in the continuing story that is Ashgrove." Five Marists were among fifty theologians and scipture scholars at the annual meeting of the Australian Catholic Theological & Biblical Associations held at St Mary's University College, Melbourne University, Jul 8-11. Three gave papers contributing to the overall theme of 'resurrection'. From left: Frs Luke Holohan (Australian province, Campion College, Sydney), Gerard Hall (Australia, Aust Catholic University, Brisbane), Kevin Waldie (NZ, Good Shepherd Seminary, Auckland), Mark Kenney (Atlanta, Catholic Theol. Institute, Strathfield) and Michael Young (NZ, Good Shepherd Seminary, Auckland). Theologian Fr John Thornhill's five-week parish-based program concluded this week with reflections on the dreams of each person in their pursuit of happiness in relating to God and each other. 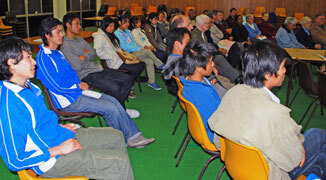 Fr John Thornhill SM with parishioners of Villa Maria parish, Hunters Hill-Woolwich. 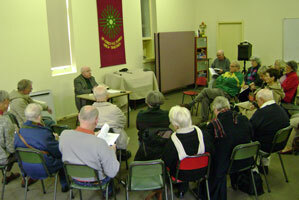 A concluding evening session was held at St Charles' parish, Ryde. After almost thirty years of outstanding service at Colin Library, Hunters Hill, NSW, Rosie Payn was thanked and farewelled by Marist provincial, Fr Paul Cooney SM, and a gathering of grateful Marists at Villa Maria monastery on Jul 05. Following the closure of Catholic Theological Union some years ago Rosie continued to oversee the operation of the library until its books were dispersed to a dozen libraries throughout Australia and the Pacific. See May News. Rosie continues to be a valued neighbour and friend of the Hunters Hill Marists as well as assisting the massive task of tidying and re-arranging the facilities of the former library. 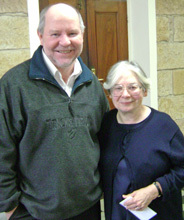 Left: Rosie Payn with Marist provincial, Fr Paul Cooney SM. 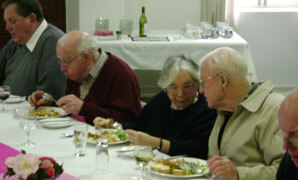 The 'thank you' and farewell luncheon for Rosie Payn at Villa Maria monastery, Hunters Hill.